Cloud technology – cloud platforms (e.g. AWS and Azure) and cloud applications (e.g. Salesforce, Workday, Tableau) are becoming an increasingly prevalent constituent of a company’s enterprise architecture. Informatica Cloud is the Gartner market-share leader (22%) in the key “iPaaS” or “Cloud Integration” sector – technology to connect cloud to cloud or cloud back to an on-premise infrastructure. 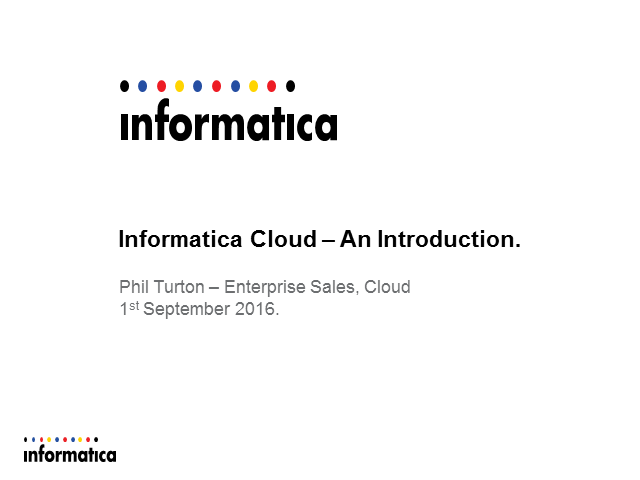 This presentation sets out the market context, Informatica product overview and position within Informatica’s strategy.